Gold Leaf Surplus Removal Brushes are used for removal of or cleaning up excess Gold leaf. Gold Leaf Surplus Removal Brushes are used after water/mirror gilding, you can "Back-up" the areas we want to keep with Back-up paint and when the Back-up paint is dry, we use the Gold Leaf Removal Brush and a little Gilders Soap and a light amount of water (you don't want to float the gold off of the glass with to much water) to remove the excess unwanted Gold Leaf, this process is so much faster than using Cotton and Gilders Soap. 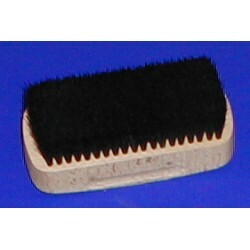 You can learn more about Gold Leaf Surplus Removal Brushes in our how-to sections of the web site. Along with the Gold Leaf Surplus Removal Brushes, we've include a few of the other commonly needed materials to Gild Gold Leaf. Individual brushes listed BELOW!